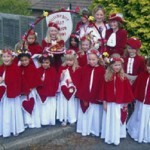 It is the 70th Anniversary this year of the annual Bletchingley May Queen Parade and Crowning. To help celebrate this achievement the Bletchingley Conservation and Historical Society would like to welcome all past Bletchingley May Queens (and/or friends and family) to our meeting in April when we will be hearing about the history of the event and looking at some of the pictures in our collection. It is worth it just to keep an eye on the changing fashions! Who knows, you may also spot a relation or two (or even yourself) as a youngster. If you would like to come along, the meeting is on April 11th at 8pm at the Village Hall. Do bring along photographs or if you still have your gown, so much the better – but don’t worry, you don’t have to wear it. If you can’t get to the meeting, we would still love to hear from you, contact via bletchingleyhistorysoc@gmail.com. Previous Topic: Do you have a spare room? Next Topic: Take up Bellringing for Fitness!